Photochemical Reactor for Enhanced Detection (PHRED) is a compact unit placed between the HPLC column and the detector to perform on-line post-column continuous photolytic derivatization to increase the sensitivity and selectivity of response of fluorescence, ultraviolet, electrochemical, and chemiluminescence detectors. PHRED consists of a lamp holder, a 254 nanometer low pressure mercury lamp, and a holder for the knitted reactor coils (KRCs). The KRCs are especially designed to fit into "PHRED" and their material of construction (PTFE) is transparent to the 254 nm uv light. PHRED is often used in the determination of aflatoxins by reverse phase HPLC with fluorescence detection. PHRED is a also a versatile unit that has been successfully employed in the determination of hundreds of other compounds including niacin and niacinamide. PHRED and the stainless steel supporting plate. 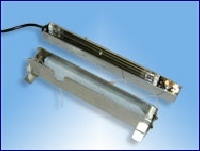 PHRED-8 Photochemical reactor unit with one 254 nanometer low pressure mercury ultraviolet bulb, one 8” polished support plate, and a package of 10 nylon ties. For 120 VAC. PHRED-12 As above, with 12" polished support plate. PHRED-CE-8 As above, with 8" polished support plate. For 230 VAC. PHRED-CE-12 As above, with 12" polished support plate. For 230 VAC. BULB-254 254 nanometer ultraviolet bulb. BULB-366 366 nanometer ultraviolet bulb. PSP-8 8" polished stainless steel support plate. 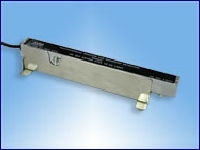 PSP-12 12" polished stainless steel support plate. Recommended Practice Aa 11-05 (Approved 2005), Official Methods and Recommended Practices of the AOCS Fifth Edition, Second Printing. Aflatoxins in Corn, Raw Peanuts and Peanut Butter using Liquid Chromatography with Post-Column Photochemical Derivatization. European Committee for Standardization. Foodstuffs – determination of niacin by HPLC. EN 15652:2009, 2009. ISO 10130:2009 Cosmetics- Analytical methods – Nitrosamines: Detection and determination of N-nitrosodiethanolamine (NDELA) in cosmetics by HPLC, post-column photolysis and derivatization. Righezza, M.,M. Murello, and A. Siouffi. Determination of Nitrosamines by Liquid Chromatography with Post-column Photolysis and Electrochemical Detection, Journal of Chromatography: 410 145-155 (1987).